TLDR: You’re going to want to buy this. There was a lot of buzz for Xanathar’s Guide to Everything before it was even in print, so I anticipated this was going to be worth a look. It reminds me a lot of what Unearthed Arcana (the book, not the webcolumn) was like for 1st edition. Was it optional? Yes. Would you be missing out on a lot of content that is considered generally mainstream to play without it? Heck yeah. Xanathar, a secretive beholder crime lord, keeps notes on everything (he believes). Hence the name of the book (his goldfish is his most prized possession, and that’s what’s on the stylized cover you see above). As with Volo’s Guide to Monsters, there are little notes that run as commentary throughout the book, usually a sort of joke or snipe about the subject matter. As the material is largely mechanics and game lore, it’s less relevant than with Volo’s but still fun. The book is 192 pages, full color, lots of art, slick non-glossy pages (which I like). You’re going to get this and think it feels kind of thin, however. While the book feels light, it has a lot of content, and they pack quite a bit in those pages. The book has three major division: Character Options, Dungeon Master Tools, and Spells, but also has two valuable Appendices. Here’s the breakdown of the sections. By far one of the most valuable sections of Xanathars is the Character Options chapter. This opens 31 new subclasses for the primary classes listed in the Player’s Handbook. That’s right: THIRTY ONE. Note that’s not 31 new classes, but subclasses (like Bardic Colleges, or Barbarian Primal Paths, etc). I like this because I think that too many primary classes waters down your base classes and leads to unexpected bloat. Some of these may be familiar as they have rolled out through playtesting in the Unearthed Arcana column. A few favorites include the Bardic College of Whispers, the Grave Domain Cleric, the Samurai and Cavalier Fighter archetypes, the rogue Swashbuckler, and the War Magic Wizard. Adding rules to differentiate these classes and giving them a new feel works well, without making a GM learn entirely new modes of play functionality. In addition to subclass details, they also offer fluff fans fun and interesting (but very brief) charts for fleshing out details about their characters and their backgrounds. More experienced players may feel these sorts of things are unnecessary, but it definitely gives some players new ways of looking at details about their characters that will flesh them out in interesting ways. Some sections are meatier than others. The Druid Section of the the Character Option chapter lists charts, for example, of what beasts you encounter in what environments for the purposes of exposure to allow wildshape. You could make it up, but this is just damn handy. Other elements, like how you learned to be a druid, are more storytelling. Each class has this sort background material. This culminates with a subsection called “This Is Your Life” which allows your background to be determined by charts, at your option. This goes through siblings, parents, family history, and motivations based optionally on class or background. I’ve always been a fan of a certain online character background generator myself (NSFW for language). I seem to recall something like this in an older volume of D&D (maybe player’s handbook 2???) but can’t remember which book. If you know, post in the comments. In the end, it can be fun, and they’re clear not to be pushy about using it. Do it, or don’t if you don’t want to. One thing you won’t hear me complaining about is more feats. I especially like the idea of Racial Feats that continue to expand the characteristics of the races in game. These add additional ways for characters to stand out and differentiate themselves from one another given the more simplified options of 5th edition over early incarnations like 3.5 and 4th editions. Tool Proficiencies – This large section rethinks Tool Proficiency, going into specific items included in certain kits, and spelling out what a player can do with skills and tool proficiencies. A valuable section that will assist GM’s and players alike in seeing how these should be played. One of the most important changes listed here is the Encounters Section. This lists a new way of calculating encounter challenge ratings that seems to more accurately address the threat of solo monsters based on group size, as well as other types of encounters. This section probably is an admission that prior CR calculations were not correct and did not accurately reflect appropriate difficulty. Paired with this is a comprehensive list of wandering monster encounters by level and geographic environment. For those that use such charts, it’s a masterpiece. Very convenient. While not previously a fan of wandering monsters, I’ve found it a useful tool when players are lollygagging or doing things in a stubborn and ineffective time-consuming way (i.e. camping after every encounter, spending an hour bonding with items in a dungeon, camping in a dangerous place, etc). The lists are detailed, and the setting dressing it provides also fleshes out your world and the creatures in. Traps Revisited — A sizable section deals with how traps should be dealt with to make them interesting, including details about constructing elaborate traps and the rules that tied therein. This is more interesting in that it seems to suggest that the standard application of a rogue disarm role should be avoided in favor of a more descriptive approach. Downtime Revisions – This section elaborates on revised downtime rules, including the development of a rivalry, buying magic items, carousing complications, and so on. Helpful if you find yourself using these rules. We never seem to get to them in my groups, however. Magic Items – A section here on magic items deals with suggestions on awarding magic items as a GM, and a type of common magic item that has magical effect and flavor without game-breaking power. A new relisting of magic items by type and rarity, with notation as to whether those items require attunement, is a handy reference. With over 90 additional spells for all spell-casting classes, this chapter alone makes this book a must-have. I haven’t combed through these to see if they have been duplicated in other volumes, but there certainly enough new ones to make it a reference for any spell-caster when picking their list. Some of these are old classics that have been revamped for 5th edition, others are brand new. Appendix B is a voluminous list of names from different cultures to help players with naming a character. It’s a great list, as it goes, with real world cultural names as well as fantasy names. This is going to make one of your players very happy. but more importantly, Appendix A is about Shared Campaigns. Skyland Games originally began as a gaming group that decided to split off from Living Forgotten Realms organized play to start our own shared campaign. Part of this split was because of frustration with the management of LFR and the various bookkeeping requirements thereof (and scenario quality, truth be told). We started our own round-robin style of gaming allowing everyone to get some play time, as well as build a common story together. We’re big fans of it. What’s proposed here contemplates a Living campaign like Adventurer’s Guild, but could be used for a round-robin home game as well. It makes use of a benchmark system for leveling based on the number of hours a scenario is designed for and its relative challenge level rather than on the XP value of monsters. Common rewards are determined at levels, including a treasure point system for awarding magic items from a pre-determined list of magic items agreed upon by the collective DM’s of the campaign. Gold can be spent on common items and maybe a small list of alchemical items. Major magic items require treasure points, earned through play. This appendix, however, poses a question: Is this the future (or maybe the present) of Adventurer’s League? I haven’t been to a game in ages, so I couldn’t tell you if they had moved to this system. If so, does the abstraction make the game less enjoyable? I think each player might have a different answer to this question, but if everyone can pay their dues and get the items they want in a timely enough fashion, the abstraction may be worth it. These guidelines won’t make you purchase the book, but are worth a read for any player. Xanathar’s Guide to Everything seems largely about utility and fleshing out things that originally were left to player and GM to determine. Some might see that as an imposition, but I find it incredibly useful. A complaint I’ve heard about 5th edition is that the lack of specialization makes many characters seem the same. I’d point out that, as a player for three decades now, we started with a lot less and never really thought to complain about it. 5th edition is a great expansion on what we started with, but doesn’t lend itself to the hyper-specialization that you see in 3.5 Edition D&D or Pathfinder. These new subclasses, feats, and spells in no way serve to make 5th Edition D&D more like 3.5 or Pathfinder, but they do give a greater degree of options to make a character stand out and build on unique themes. The content provided in this tome is very significant, and is a should-have if not a must-have moving forward with 5th Edition. Dungeon Masters Guild – Return of the OGL? Today is a day many felt would never come. Wizards of the Coast has released a pile of 5E information under a new System Reference Document and Open Gaming License. Not only that, they are selling Adventurer’s League materials through the newly formed Dungeon Master’s Guild. This allows 5E D&D enthusiasts to purchase the AL materials and run them in home games if they don’t live near to a FLGS that sponsors such games. The implications of this are far-reaching, and some would argue, overdue. Most notably, Goodman Games and Kobold Press started creating adventures for 5E without a clear licensing framework in place for such content. Unlike the 4E era, the 5E OGL allows a good bit of proprietary content for use in independent development. 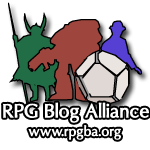 Not only that, but in a partnership with OneBookshelf, anyone can create 5E Forgotten Realms content (with certain restrictions) and get paid 50% of the asking price. The remaining 50% is divided between OneBookshelf and WotC, respectively. Many RPG enthusiasts have been requesting this kind of move since the development of 4E. The Skyland Games crew first came together under the D&D Encounters program hosted at an FLGS in 2009. Even then, players were lamenting on the now defunct community boards about the Encounters materials not being available for purchase, only available through store play. This new program provides options for players and GMs alike, and provides WotC with a brand new revenue stream. Content created as part of the Dungeon Masters Guild can be considered for additional publication by WotC, included in digital games (Sword Coast Legends?) and possible marketing materials. This is a huge win for WotC, but also a huge win for the community. OneBookshelf offers any pricing model from free, pay-what-you-want, and set prices, which allows the flexibility to create a teaser adventure, then a series of paid adventures, or just let fellow DMs set their own price based on what they feel the content is worth. This model has worked surprisingly well for content creators on other OneBookshelf properties like RPGNow and DriveThruRPG. Hopefully this program will be a resounding success, and more material and worlds will be released to an eager gaming community. Previous editions of D&D? Greyhawk? Dragonlance? Dark Sun? All speculation for now. Since this gaming group was founded around a company of dwarves adventuring in the Forgotten Realms, maybe one day, your own dwarven clan can follow the path of the Feyhammers. Questions? Hit up the AMA on reddit January 15th at 1pm Eastern time.